The Anschutz Health and Wellness Center is anchored by an extraordinary 95,000 sq. ft. building which opened in April 2012. The facility is a five-floor “green” complex designed to be a hub of activity at the heart of the Anschutz Medical Campus and the City of Denver. It sets a new, global standard for integrated, cross-disciplinary research to create practical solutions to promote healthy lifestyles and prevent disease. The building’s design reinforces the center’s mission: to get Americans moving and promote healthier eating. The building is specifically designed to allow for close collaboration by experts in the fields of nutrition, exercise physiology, obesity/weight management, and behavior change in a single, state-of-the-art facility. The resulting synergies will foster not only the development of knowledge from research, but the efficient and effective translation of advanced scientific understanding into impactful clinical and community programming. Aquatics facility featuring a 100 sq. ft. spa and an 800 sq. 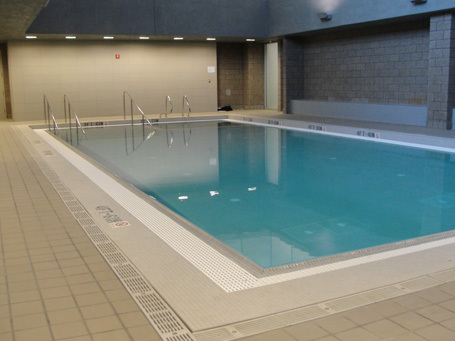 ft. therapeutic pool providing water-based exercise for group fitness and therapeutic exercising. Upon completion, the Wellness Center received the U.S. Green Building Council’s Leadership in Energy and Environmental Design (LEED) Gold certification for energy efficient design.